More often than not the way you watch something will go a long way to drastically shaping your viewing experience of that event. For example, watching a film at the cinema and seeing it on the big screen with awesome sound blaring out at full volume will enhance that film far beyond the level of watching it while at home on TV. The same goes for sporting events. 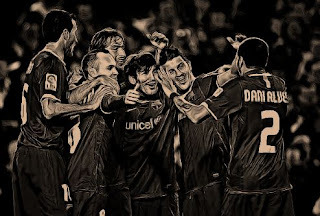 What struck me most of all while at the Camp Nou Saturday night was just how quickly time flies when you’re watching possibly the greatest side of all time. On TV Barcelona’s matches can sometimes seem to go on for a while as they out pass the opposition, but watching it live you almost fall into a hypnotic trance, watching them pass the ball from player to player with laser guided precision you really can fully appreciate just how skilled this team is and how far above any other club team they currently are. Saturday night’s 3-0 win over Atletico Madrid will not go down as an all time classic performance, it will not be remembered as a historic night in the clubs history, it is simply another win that takes them that bit close to winning the league once again. As the weeks have gone on throughout the season it seems more and more likely that Pep’s will once again be crowned Spanish champions. They hold a seven point lead over Jose’s Real Madrid and only a very brave person would bet against them holding onto that lead for the rest of the season. Atletico Madrid went into Saturdays match against Barcelona languishing in midtable, in-fighting going on throughout the club and with their star man, Diego Forlan, starting on the bench. Quique Sánchez Flores adopted a 4-5-1 formation with Aguero in the loan striker role. Flores stuck with this formation until half time when Forlan was introduced up front to give the team some much needed help in attack. Unfortunately by then the game was all but over after a first half full of quality and blistering attacking play from the home side. With only Puyol missing from the side through injury, Barcelona were at almost full strength going into the match. And while Messi once again grabbed all the headlines for his well deserved hattrick , it was Abidal who was arguably the most commanding figure in the game. The Frenchman was in at centre back, taking the place of the injured Puyol and it is to great credit to the way he performed that old captain caveman wasn’t missed at all. This was as strong and confident a performance from a centre back as you are likely to see this season. The match started as predicted with Barcelona gaining control of the ball right from the word go with Atletico sitting back and trying to counter. Barcelona were quickly into gear with quick probing passing looking for a way past Madrid’s defence. And then out of nothing it would seem Messi is through. A lovely through ball by Iniesta released Messi throw on goal after barging past an Atletico defender with ease and charging at de Gea with menace. But as de Gea saved with his legs and stopped Messi from going round him, the referee blew for a free kick, Messi judged to have fouled the Atletico defender as he barged passed him. Several other good moves led to nothing thank to a combination of poor finishing and poor decision making in the final third. That reprieve wouldn’t last long. Barcelona took the lead with what is now a standard goal for them. Daniel Alves picked up the ball on the right side of the pitch and looked up to play a short pass to the always available Messi. The diminutive Argentinian collected the ball and dribbled from the right of the penalty box, past four defenders in a trademark move before sliding the ball low and hard to the bottom left corner of the net, past the out stretched glove of de Gea. Ateletico tried their best to respond, Reyes was lively down the left and Augero worked hard up front but a second goal for Barcelona was on the cards and soon arrived, but not before Barcelona wasted some more good chances. David Villa fired into the side netting from outside the box before Messi was played through by Alves after a lovely flowing move, this time the Argentine fluffing his lines and firing narrowly wide. He wouldn’t have to wait long for his second goal of the evening. And once again it’s a flowing move coming down the right side. Xavi, Iniesta and Alves all were involved once again before David Villa slipped the ball through to Messi who cooly slipped the ball past the keeper for his second goal. Not only did this all but end the match as a contest, it also enraged the Atletico Madrid fans who felt Messi was offiside. He wasn’t. But if that upset them, what came next caused them to lose their cool all together. After Alves was booked right on the byline for giving away a free kick for a late and rash tackle on Augero, Madrid took a quick free kick, firing the ball into the net as Barcelona were organising their defence. But before Atletico can celebrate the referee pulls the play back and orders they retake the free kick and wait for his whistle. To say this caused a reaction from the Atletico players would be an understatement. That was the last real action of the first half. However the second half started on a much brighter note for the team in red and white thanks to the half time introduction of Diego Forlan. With an added forward on the pitch Madrid looked a far better side. His ability to create space for others and his general presence on the pitch forced Atletico further up the pitch, reducing Barcelona’s time on the ball and helping to make the second half a more even contest. In fact if Forlan hadn’t had a fresh air shot when presented a near open goal the match may have taken a very different twist. But he did and the match was soon killed of all together when Messi completed his hattrick despite his best efforts to get Villa a goal. His beautifully judged through ball sent Villa through on goal but his effort was blocked by the on rushing de Gea and left the ball to fall kindly to Messi who bundled the ball over the line to complete the scoring. After that both sides pushed on to try and score but to no avail and the match sort of petered out, leaving the Barcelona fans to practice their Mexican waves. And with that my first experience of the Camp Nou was over. Being sat up in the Gods behind the goal gives you a chance to witness the pattern of the game that simply doesn’t come across on TV. The off the ball movement really is something you can’t explain in an article, you just have to see it for yourself. And a special mention has to go to the old couple sat next to me. The old woman was as passionate and as full of life as you will see from a football fan. Even after she established that my Spanish wasn’t up to much it didn’t stop her from turning to me several times during the game and screaming at me as if the men on the pitch were in fact related to her. Her husband didn’t move the whole time. He was as docile as Mascherano. And I was wrong before when I said that this match wouldn’t go down in history and that it was just another win. In fact because it was just another win makes it historic, sixteen wins in a row in the league to be precise, surpassing the fifteen in a row achieved by the great Real Madrid side of the 1950’s. Has routine ever been so exuberant?